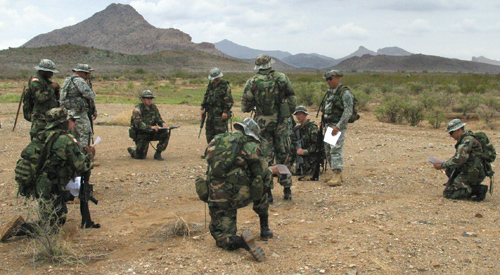 B Troop, 2nd Battalion, 102nd Reconnaissance, Surveillance, Target, Acquisition conduct classes outdoors while stationed in Las Playas, N.M. The rotation to the border observation sites allowed for unit training and rest between shifts. More than 200 Soldiers of the 3rd Battalion, 112th Field Artillery; 2nd Battalion, the 102nd Reconnaissance, Surveilance, Target, Acquisition and the 1st Battalion, 114th Infantry along with medical support from Army and Air Guard units volunteered for Operation Jump Start (OJS) in New Mexico, an alternative to the traditional annual training. From July 21 to August 10, New Jersey provided the first rotational unit for OJS, and as the first, set the standard for other states to follow. While some Soldiers and Airmen stayed for two weeks in Deming, others remained for the full three weeks in Las Playas. During that time, the Garden State contingent supported the Customs and Border Protection (CBP) effort at established sites as the CBP's “eyes and ears” in the "Boot Heel" of New Mexico (so named for its shape on a map). The Soldiers served on Entry Identification Teams - a mix of personnel, technology and infrastructure providing the CBP more flexibility to apprehend undocumented aliens and drug runners in their effort to improve the quality of life in nearby communities. The Boot Heel region has a Jekyll and Hyde quality. In the daytime it is sweltering and dead. Only at night does the desert turn cool and alive. A single constant remained, the innumerable footprints from the people trying to illegally enter the United States. While every Soldier has his own story, these two represent the full spectrum of experiences Task Force New Jersey encountered. One was an active and thrilling pursuit while the other was a lesson on humanity in the framework of duty. 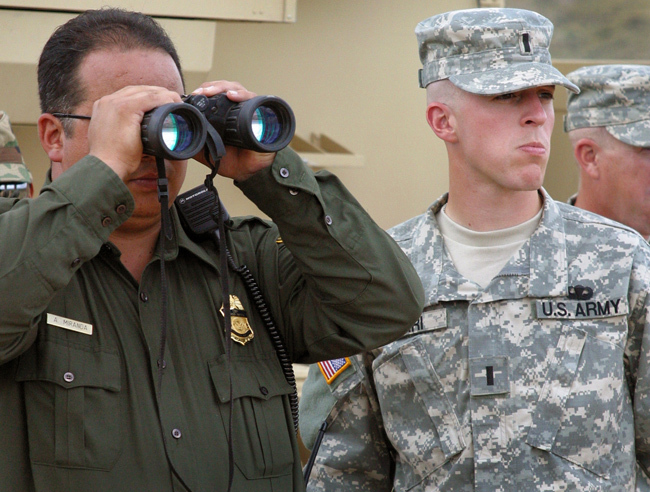 - First Lieutenant Vincent Tirri, right, from the 2-102nd RSTA discusses a suspicious dust cloud with Senior Border Patrol Agent Adrian Miranda at one of the entry identification sites manned by N.J. Army Guard Soldiers. Tirri was part of the shift that identified 19 undocumented aliens and assisted Border Protection Agents in their detention. First Lieutenant Vincent Tirri had just begun his shift, “I thought to myself: Oh man, this may be a boring night. Then there they were.” Through the FLIR (forward looking infra-red) Tirri saw more than a dozen figures in the illuminated green monitor. The figures on the screen were at least 2,000 meters away. “They looked just like troops in the simulator marching in a line.” “I called the next site with the SINGARS radio and asked them to relay the message,” 1st Lt. Chung Lee recalled. Soon, a CBP officer responded and confirmed that the images on the FLIR were people and immediately called for back-up. The rolling terrain complicated the effort. “We would lose them, pick them up and lose them again as they moved through the hills, they were moving quick,” said Tirri. Highway 9, a few miles north of where the UDAs were spotted, offered the chance at escape in a waiting automobile or to cross the road and disappear in terrain rugged enough to hide from both the FLIR and the CBP. Several CBP officers arrived and parked their trucks along the highway. Lee continued guiding them onto the image – and then the ghostly green figures were gone. “We lost them for too long so I moved to a hilltop about 400 meters away,” said Tirri. He and the officer resumed the search using the command laser unit, to recognize the thermal patterns of a human. Lee remained at the FLIR and cooperated with Spc. Anthony Larobina, at a different site, to find the group very near Highway 9. Now the CBP officers got out of their trucks and began searching acres of desert without success. It was too dark to see anyone. Finally, one of the officers radioed he had found some boot prints and another said he had heard footsteps running south. With the coordinated instructions from the three sites the CBP officers were guided to 19 UDAs hiding in a gully, almost invisible from a distance – except to the military systems used to detect them. Pfc. Isaias Castillo and Staff Sgt. Gene Kuhar also had an eventful shift, yet completely different from Tirri and Lee. In the hours after sunrise a single man approached their site and asked for help. - Sgt. Carlos Sierra (left) using the command laser unit and Pvt. 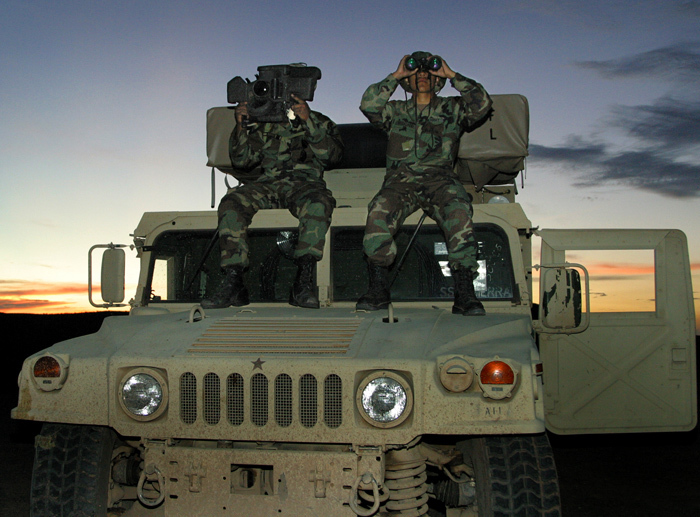 Wilber Regalado (right) with binoculars scan the desert from their vantage point on an Avenger HUMVEE. Speaking Spanish, Castillo ordered the man to stop a safe distance away. “I asked him who he was and what he was doing, he immediately told me he was with a group of people and they needed help. ”The man then signaled to them and like gophers from their holes more than 20 people emerged from the brush. Castillo ordered the group to approach in a single file and face away from the site. Abandoned by their “Coyote” - the human trafficker they paid to lead them into the US - they wandered the desert, lost throughout the night. The Soldiers offered water to the group and waited for the CBP to come and pick them up. Many in the group expressed their thanks for the kindness. “After being down there, seeing that end of the problem, the struggle they go through to get here and realizing they paid their life savings to do it, I understand why they do it but I still don’t agree with it,” reflected Kuhar. Thus more than three dozen people were returned to Mexico, and here is the last contradiction of OJS, the way success is measured. Although it would seem that the numbers of UDAs spotted and turned over to the Border patrol officers stand as the marker of success, the true success lays in the quiet night when Soldiers saw no one at all. The visible deterrence keeping the desert as it should be – deserted.